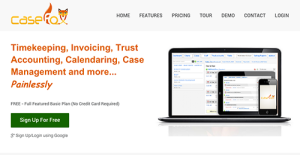 CaseFox is a system developed for attorneys, accountants, or professionals who bills clients by the hour. What CaseFox does is helping you time and bill your customers accurately and without any effort. Aside from time tracking, billing, and invoicing, CaseFox also comes with other significant tools that can make your work a lot easier, such as document management and case notes among others. You can also allow, limit and tweak access to data based on role authorization. CaseFox offers secured databases for your information, where all data are processed once you enter them into the system. Professionals and companies that provide services need an easy-to-use software to handle their routine timekeeping, invoicing, simple accounting, and case management features. Affordability is also an important factor and CaseFox fits well there in contrast to their competition. CaseFox has put together an easy to use, role-based multi-user interface that includes a rich feature set that it’s suitable for individuals as well as firms having multiple employees. The best way to summarize CaseFox is that it offers the type of features that are carefully designed based on years of customer feedback and industry needs. The features are put together in such a way that they save time for the users. For example, CaseFox can generate overdue reminder letters for all open invoices in just one click. Cost-effective solution that lets you add users to to your account for no additional charge (for paid accounts). Easy and simple interface lets you get acquainted with the system real fast. Access all areas that you need without jumping from screen to screen. CaseFox provides a rich calendar feature including syncing events to multiple users’ Google calendars and rule-based calendaring triggers to automatically create secondary events based on entered events. Ease of timekeeping is a dominant feature that CaseFox offers. Timekeeping is very flexible in that various types of time entries can be entered easily and different hourly rates can be set for staff members at different granularity. Ability to generate LEDES format invoices without additional effort is also a key benefit. CaseFox offers extensive reporting, and ability to export data including one-click export of all data. CaseFox also offers timekeeping via SMS messages, real-time reporting of timekeeping summaries at different granularities, extensive trust accounting features, phone message record keeping, and notifications. CaseFox integrates with Xero Accounting, Quickbooks, Dropbox, Google Drive, Tasks, Email, Calendar, and Contacts, and offers single sign in with Google credentials. CaseFox also provides Tasks, Documents and other case management features. In summary, CaseFox offers all features and benefits at one place that a solo attorney or a small-medium size firm may need. What Problems Will CaseFox Solve? Generating bulk invoices can be a tedious task that requires many hours of work. CaseFox’s “one-click” bulk invoice generation can save you hours of grueling effort when a large number of cases need to be invoiced. Generated invoices can be quickly downloaded in a zip file or can be emailed to clients directly from CaseFox. Sometimes, businesses hire contract staff but they do not want to give the contract staff access to view or alter any data. CaseFox can help with its preconfigured role function that enables the admin user to grant contract staff access only to selected cases. They can view their own time entries only and enter new time entries for themselves. They do not see any other data. Even further, they may also be restricted from viewing their hourly rates as billed to the clients. It's important to realize that hardly any app in the Accounting Software category will be a perfect solution that can fulfill all the requirements of various business types, sizes and industries. It may be a good idea to read a few CaseFox reviews first as certain software might excel exclusively in a really narrow set of applications or be created with a very specific type of industry in mind. Others may operate with a goal of being simple and intuitive and as a result lack complex functions needed by more experienced users. You can also find services that focus on a wide group of customers and offer a powerful feature toolbox, but this in most cases comes at a higher price of such a software. Ensure you're aware of your needs so that you buy a service that provides exactly the elements you look for. How Much Does CaseFox Cost? CaseFox pricing plans are composed of three bundles, each designed to suit varying needs and business requirements. A free version is also available for those who are still considering trying out CaseFox for their business. Silver ($10 per month or at discounted price of $100 per year) – up to 25 cases, 5 users (extra $5 per additional user, document storage integration with Dropbox and Google Drive. Gold ($20 per month or at discounted price of $200 per year) – up to 50 cases, 5 users (extra $5 per additional user, document storage integration with Dropbox and Google Drive. Platinum ($35 per month or at discounted price of $350 per year) – unlimited number of cases, 5 users (extra $5 per additional user, document storage integration with Dropbox and Google Drive. We realize that when you make a decision to buy Accounting Software it’s important not only to see how experts evaluate it in their reviews, but also to find out if the real people and companies that buy it are actually satisfied with the product. That’s why we’ve created our behavior-based Customer Satisfaction Algorithm™ that gathers customer reviews, comments and CaseFox reviews across a wide range of social media sites. The data is then presented in an easy to digest form showing how many people had positive and negative experience with CaseFox. With that information at hand you should be equipped to make an informed buying decision that you won’t regret. What are CaseFox pricing details? What integrations are available for CaseFox? If you need more information about CaseFox or you simply have a question let us know what you need and we’ll forward your request directly to the vendor.